If you are getting together with friends, one of my favorite appetizers to bring are these delicious Jalapeno Poppers. These aren’t your traditional poppers though. 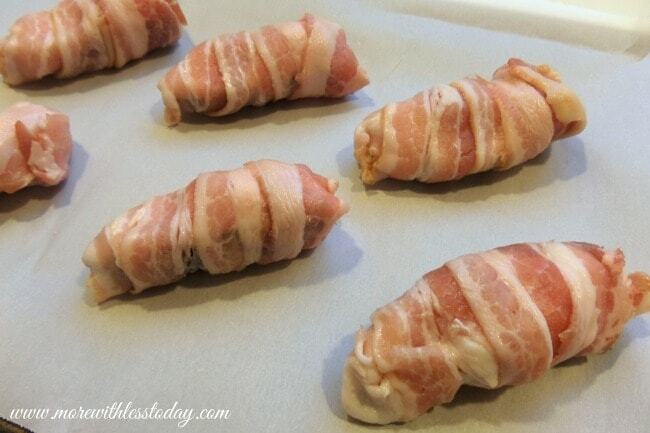 They are bacon wrapped and stuffed with a cream cheese and chicken breast filling. They are so easy. You’re going to love them and so will the party guests. In a medium bowl separate the chicken. 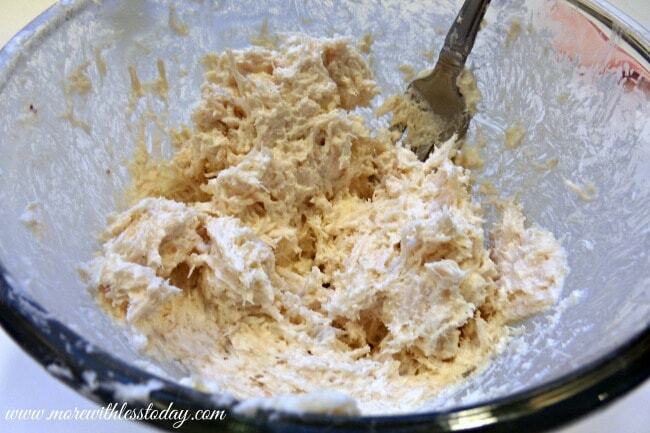 Stir in the softened cream cheese until well combined. Cut the jalapeno peppers in half lengthwise. Remove the stem and seeds. Rinse and dry the pepper halves completely. 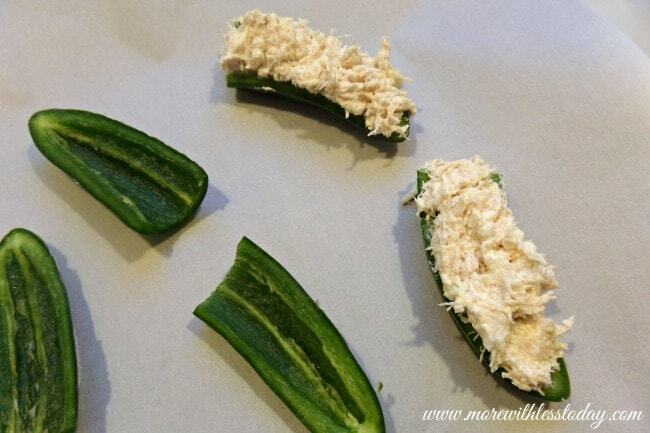 Fill each jalapeno half with the chicken and cream cheese filling. You’ll want the filling to be piled high as it will melt down some during the cooking process. When all of the peppers are stuffed wrap a piece of bacon around each one. I started at the tip and wrapped towards the stem, tucking the end of the bacon in to cover the filling. Bake the poppers in a preheated oven for 18-20 minutes. Turn the oven to broil and continue baking until the poppers are crisp. They really are! I love traditional poppers to but the chicken adds a great filling. Also, being baked instead of fried, they aren’t as bad for you. Because bacon is never bad for you, right? Those look amazing! Anything with bacon is a winner. This looks amazing! 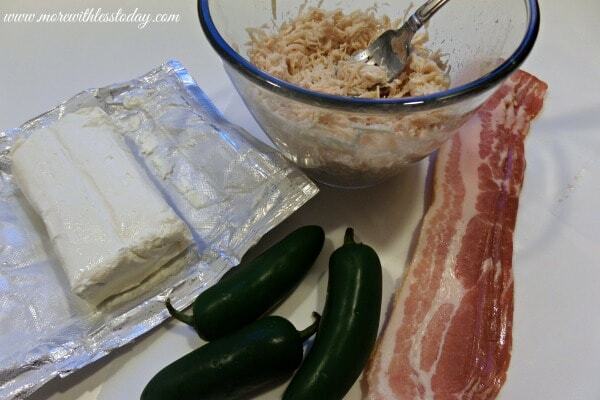 I love that this has two of my favorite ingredients, bacon, and spicy jalapenos. I will have to make this for my new years day guests. Those look really good. We also make these, but we use shrimp sometimes when we can. Now I want to have some for dinner tonight. 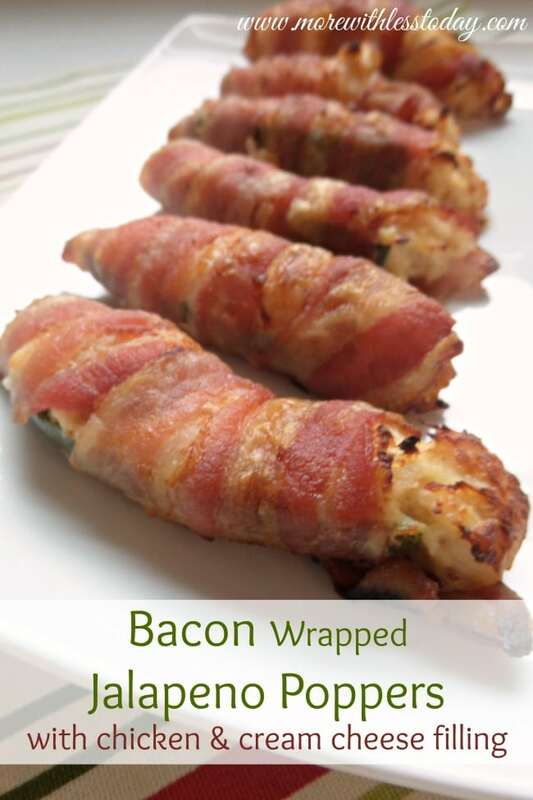 My husband loves anything spicy and with bacon, so this is the perfect recipe for him! OMG, you took one of my favs and made it even BETTER! These look and sound amazing. They would be perfect for New Year’s! 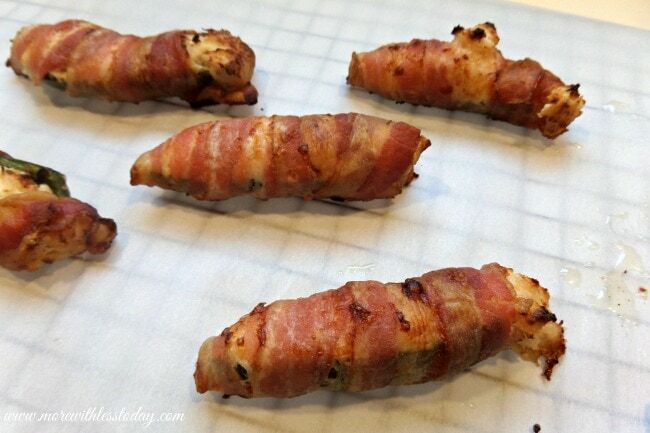 These will be so perfect to make for our Super Bowl party!! Thank you! John loves anything with bacon!! !These would be great for play off games too coming up! Everything goes great with bacon! This sounds like a nice spicy recipe my husband would enjoy! Jalapeno poppers were so good already. This recipe kicks them up a notch! Wow! These sound really delicious. Jalapeño poppers with chicken? I have never had those before, but can’t wait to try. Wow, those look really tasty for gameday. What a creative way to combine peppers, chicken and bacon. I love the addition of chicken to the filling! They are like a mini-meal that way! Yum, these do look like tasty appetizers! I love cheese and spice! Oh wow, that looks fantastic. I know I would love them.